This is the nationally certified NRA class that teaches students to operate and shoot any rim fire or center fire pistol, ammunition knowledge, selecting the right pistol to purchase, care and maintenance, and proper storage. 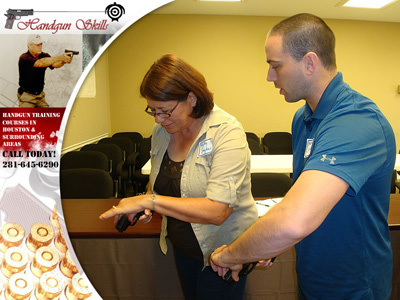 Passing this class is also a requirement if you plan to take the NRA Basic Instructor Training and Pistol Instructor Course to be certified as a NRA Pistol Instructor. Learn to operate all revolvers and semi-automatics, gun safety training, ammunition training, fundamentals of shooting, storage practices, and practical shooting drills and qualification levels. You can shoot any caliber pistol between .22LR and a .45 ACP. Rental guns will be available and you will shoot approximately 100 rounds in shooting exercises. Ammunition can be purchased at the range or you can bring factory loaded ammunition for your pistol. This is the same class taught nationwide as a NRA certified training class and students are awarded a nationally recognized NRA Certificate for successfully completing the class. NRA Pistol Instructor candidates must take the full day instructor led class as a pre-requisite to attending the NRA Instructor Pistol Course. You must register at least 14 days in advance of class to allow time for NRA to ship your training materials to us. If less than four people pre-register the class will be cancelled and deposits refunded. Last minute registrations taken if four people have pre-registered and we have any extra NRA required training materials. We only consider minors under 18 for training if a parent or guardian takes the training with them. Payment with your registration is required to reserve a slot for a class. If you cancel attending more than 48 hours prior to the scheduled start time of a class you’ve registered for there will be a $50 cancellation fee deducted from your refund to cover our advance administrative costs. Cancellations within 48 hours of a class are subject to a $75 cancellation fee. If you do not cancel or show up for your class you forfeit your pre-payment.